Order Item# 10341 for irrigation to travel through a sterile pathway to a 4-Hole air driven Handpiece. Also contains two autoclavable bottles, one sterile pour bottle adapter, and Installation Kit to retrofit one dental unit. **May require a Retrofit Swing Arm, Item# 10225. NEW – order 10344 kit if your Handpieces are 6-pin configured. Order Item# 10015 for dental units already retrofitted for a High Speed – 4 Hole System. Allows units to be rotated through the autoclave for ensuing procedures. NEW – order 10013 if your Handpieces are 6-pin configured. Order Item# 10342 for irrigation to travel through a sterile pathway to an autoclavable Air / Water Syringe. Also contains two autoclavable bottles, one sterile pour bottle adapter, and Installation Kit to retrofit one dental unit. Order Item# 10008 for dental units already retrofitted for an Air / Water Syringe System. Allows units to be rotated through the autoclave for ensuing procedures. 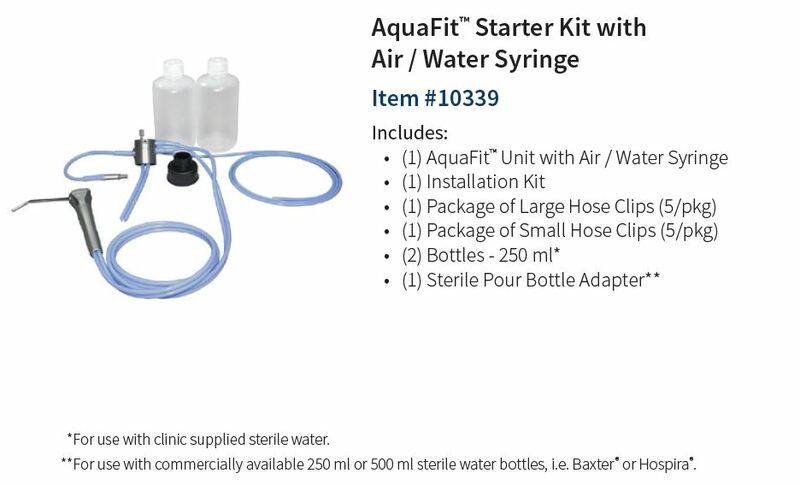 Order Item# 10343 for both the AquaSept™ High Speed Starter Kit (Item 10341) and the Air / Water Syringe Starter Kit (Item 10342) packaged together at a discounted price. NEW – order item 10345 kit if your Handpieces are 6-pin configured. Order Item# 10337 for irrigation to travel through a sterile pathway to an electric Handpiece or ultrasonics (Acteon™) Handpiece. Also contains two autoclavable bottles, one sterile pour bottle adapter, clips to attach the irrigation tube to Handpiece cord, and Installation Kit to retrofit one dental unit. *Requires a sterile irrigation port for the AquaFit™ tubing to attach to the Handpiece. Contact your Handpiece manufacturer. NEW – order item 10337-C for irrigation to Cavitron® systems. If retrofitting stand alone Cavitron® units, call 888-539-3907. Order Item# 10227 for dental units already retrofitted for an AquaFit™ System. Allows units to be rotated through the autoclave for ensuing procedures. NEW – order item 10227-C for irrigation to Cavitron® systems. Order Item# 10339 for irrigation to travel through a sterile pathway to an electric Handpiece or ultrasonics (Acteon™) Handpiece. Also contains one autoclavable Air / Water Syringe System uniquely attached to the AquaFit™ system, two autoclavable bottles, one sterile pour bottle adapter, clips to attach irrigation tube to Handpiece cord, and Installation Kit to retrofit one dental unit. NEW – order item 10339-C for irrigation to Cavitron® systems. If retrofitting stand alone Cavitron® units, call 888-539-3907. Order Item# 10229 for dental units already retrofitted for an AquaFit™ System with Air / Water Syringe. Allows units to be rotated through the autoclave for ensuing procedures. NEW – order item 10229-C for irrigation to Cavitron® systems. Order Item# 10222 to retrofit another dental unit when individual High Speed Systems are not needed. Included with Items 10341 and 10343. Order Item# 10224 to retrofit another dental unit when individual Air / Water Systems are not needed. Included with Items 10342 and 10343. 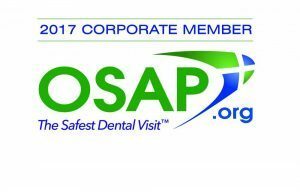 Order Item# 10228 to retrofit another dental unit when individual AquaFit™ Systems are not needed. Included with Items 10337 and 10339. Order Item# 10225 when a 1/2″ hanger bar is unavailable on the dental unit or when panel mounting the quick connect is not available. The Retrofit Swing Arm installs on the underside of the dental unit. For questions whether a Retrofit Swing Arm is needed, call 888-539-3907. Order Item# 10437 to utilize Baxter® or Hospira® brand sterile pour bottles for irrigation. This adapter allows the large mouth of the sterile pour bottle to fasten directly to the AquaSept™ or AquaFit™ unit. Do not use bottles larger than 500 ml with this adapter. All starter kits are supplied with a Sterile Pour Bottle Adapter. Order Item# 10440 to pour sterile irrigation directly into a bottle. 4 oz (ml) is typically used for a procedure requiring very little water. Order Item# 10441 to pour sterile irrigation directly into a bottle. 8 oz (250 ml) is the typical amount of water required for a typical procedure. All individual units and starter kits are supplied with two 8 oz (250 ml) bottles. Order Item# 10439 to pour sterile irrigation directly into a bottle. 16 oz (500 ml) is considered a lot of water for one procedure. Requires item 10438. Order with Item# 10439. Allows the larger mouth of the 16 oz bottle to fit the AquaSept™ or AquaFit™ system. For other accessories not listed, call 888-539-3907.